American tether technology satellite. 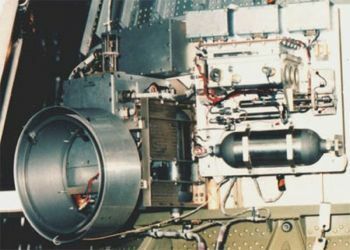 Plasma Motor Generator Technology satellite operated by NASA, USA. Launched 1993. AKA: Plasma Motor Generator. Status: Operational 1993. First Launch: 1993-06-26. Last Launch: 1993-06-26. Number: 2 . Family: Technology, Tether technology satellite. Country: USA. Launch Vehicles: Thor, Delta, Delta 2 7000, Delta 7925. Projects: Navstar. Launch Sites: Cape Canaveral, Cape Canaveral LC17A. Agency: MDAC. Bibliography: 2, 279, 11629. 1993 June 26 - . 13:27 GMT - . Launch Site: Cape Canaveral. Launch Complex: Cape Canaveral LC17A. LV Family: Thor. Launch Vehicle: Delta 7925. PMG - . Payload: Plasma Motor Generator. Nation: USA. Agency: MDAC. Program: Navstar. Spacecraft: PMG. Decay Date: 1993-08-30 . USAF Sat Cat: 22701 . COSPAR: 1993-042B. Apogee: 677 km (420 mi). Perigee: 185 km (114 mi). Inclination: 25.70 deg. Period: 93.20 min. PMG Far End Package - . Nation: USA. Agency: MDSSC. Program: Navstar. Spacecraft: PMG. COSPAR: 1993-042xx.